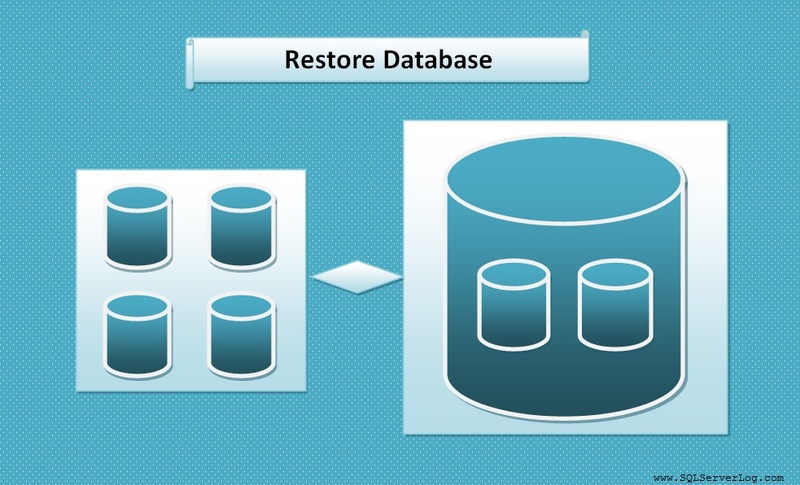 In previous article we have seen database backups and types, so in continuation to that we are going to discuss about how to restore database on same instance or different instance. 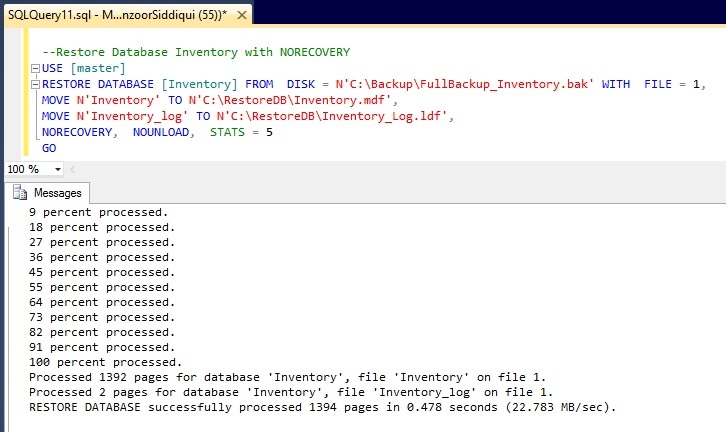 We have already taken full backup and transaction log backup of ‘Inventory’ database. 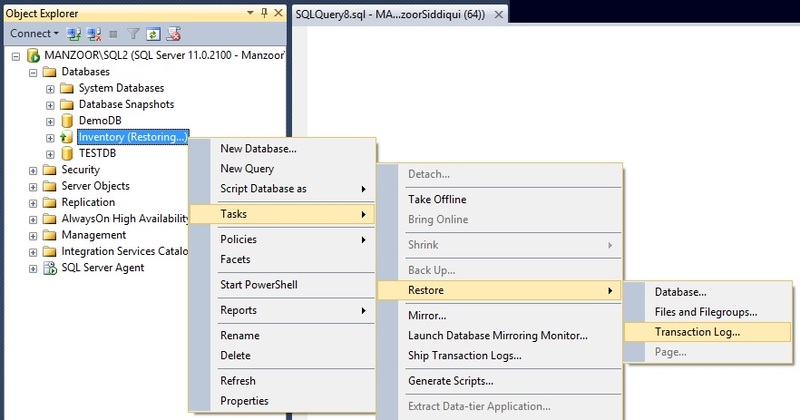 We will restore the database on different instance by SSMS and T-SQL. We already have ‘Create Database’ permission on new instance. 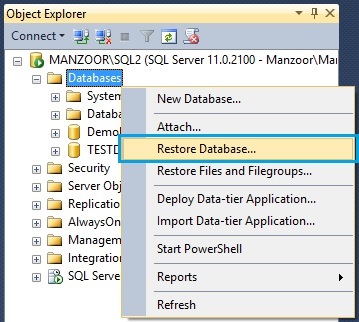 Now connect to SQL Server Management Studio and follow below steps to restore. 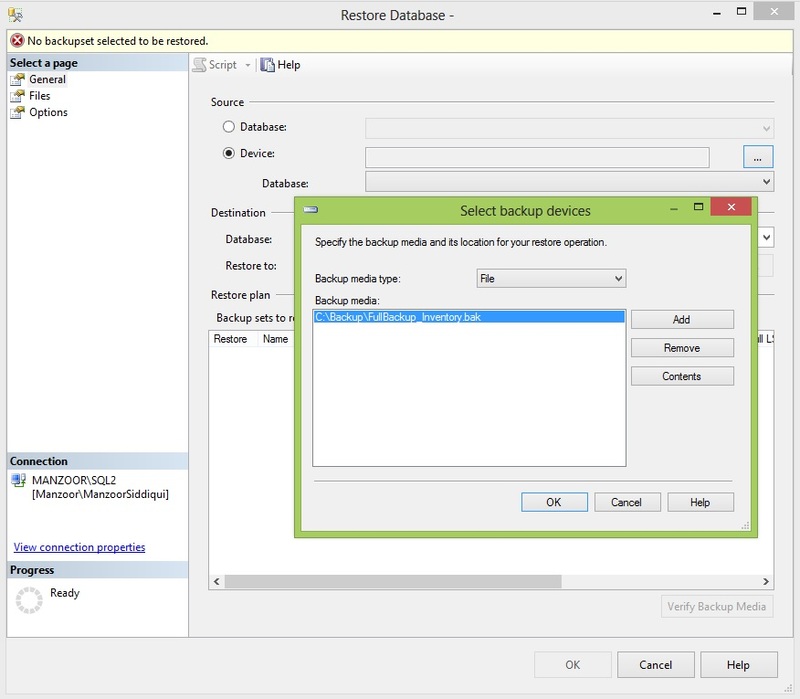 Once backup file is selected you can refer restore plan details like database type, server name, database name, first LSN, last LSN, size, user name etc. Now go to Files in ‘Select a page’ section on left side of the window and you can change the restore path of master data file and log file in ‘Restore As’ navigation. In Options page you have different choice to select as per your requirement and work scenario. In Options you can also select recovery state as per your recovery strategy. Recovery state has 3 types. – RESTORE WITH RECOVERY: It is a default option, once restore is completed it makes the database online to work. 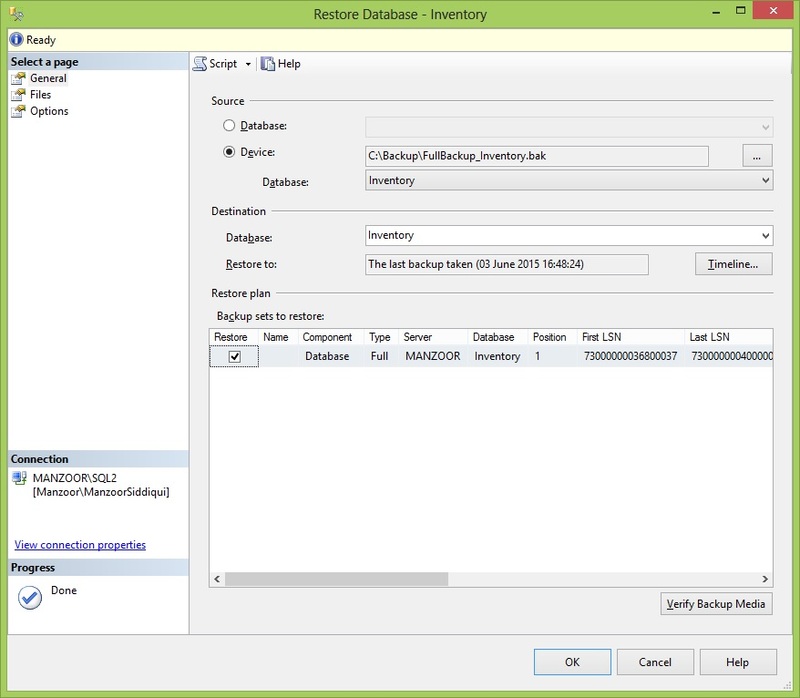 – RESTORE WITH NORECOVERY: It keeps the database in recovering state to restore more backup files, you cannot use database until it is fully recovered. 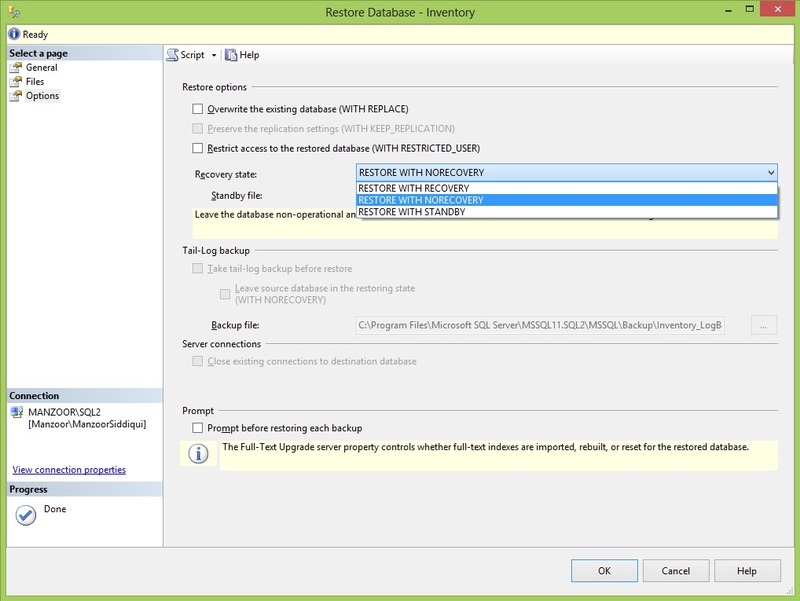 – RESTORE WITH STANDBY: It sets the database in read only mode. As we have to restore transaction log also so we have kept database state in RESTORE WITH NORECOVERY. Once you click OK button, restore operation will begin and you will get message Database ‘Inventory’ restored successfully. 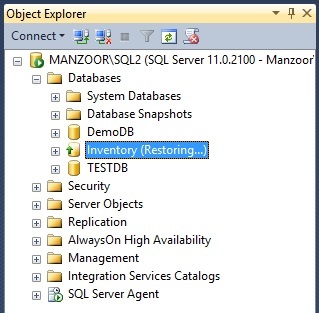 Now refresh the database node and you can observe that database is in ‘Inventory (Restoring…)‘ state as shown below. Now we will restore transaction log WITH RECOVERY state so that once restore is completed, database will be online and ready to use. Now choose From file or tape option and add your transaction log file from backup path. By default point in time is selected, then go to Options page and select recovery state as RESTORE WITH RECOVERY and click OK. Once restore is completed you will get successful message as shown below and database is online and ready to use. 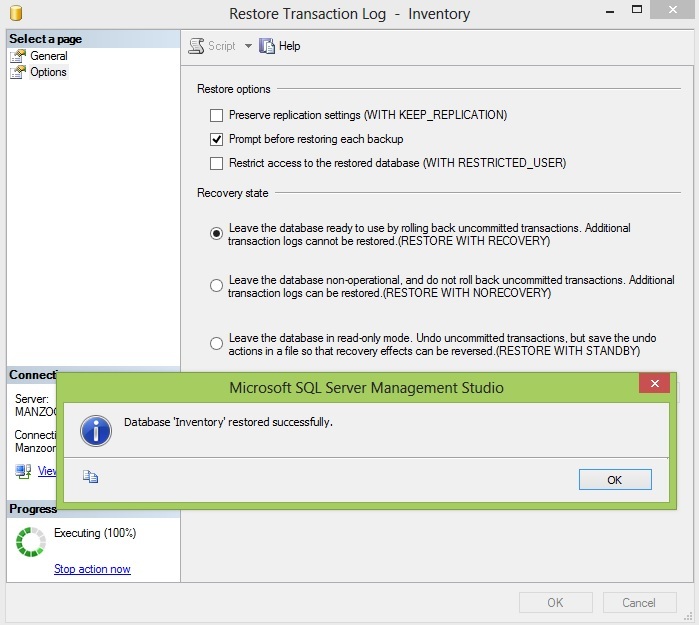 Now we will do the restore process of full backup and transaction log backup of database with T_SQL. Then restore transaction log with RESTORE LOG command as given below. Our ‘Inventory’ database is now restored completely and ready to use.